Disaster Preparedness: Are you Prepared? Is our Neighborhood Prepared? It is approaching one year since the devastating fires of October 8, 2017. Many of us would like to forget those tragic days that devastated some of our neighbors. I think we all came away from that experience with a deeper understanding of our own vulnerability and appreciation of how important neighbors helping neighbors will be to our ability to survive and recover from a fire or an earthquake. The fires made me realize the importance of being organized and prepared for a disaster, on a family and a community level. Some of you may remember back in 2008 when our neighborhood association was working on disaster preparations at the block and neighborhood level. Many of us have a pretty good idea of what we need to do, but the fact is that we were not able to sustain this effort long enough to really prepare adequately for a disaster like the recent fires. These reflections of the fires and future disasters lead me to conclude that we all need to rethink our roles in our community. Are we putting the time and effort needed to address the vulnerability of our neighborhood and really prepare for the next disaster? Please join us on September 18th to learn more about how to prepare for the next disaster. The Burbank Gardens Neighborhood Association encourages neighborhood participation by working to maintain the historic value, beauty, safety and diversity of our neighborhood. We collect, organize and distribute information pertinent to all residents and provide a unified voice to the City. Contact me to add information to this website. 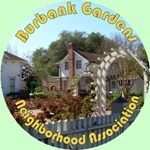 The Burbank Gardens Neighborhood Association (BGNA) is a California Unincorporated Nonprofit Association. All material on the BGNA Newsletter, email, Website, Facebook© and/or other printed or electronic communications (content, logos, graphics, and images) is the property of the BGNA and no person or entity may duplicate, upload, republish, modify, transmit, post or distribute or mirror the BGNA's information without the expressed written permission to do so from the BGNA. California Corporations Code 21300.